All about those headlines you just have to click. 90% of the traffic your articles draw will be because of the headline - not the content that follows. This is because few will see the content that follows unless the headline is good. That is where "clickbait" headlines come in. You are probably reading this article because of the headline. Search engines demonstrate this principle in action: We enter a search term and receive instant results, often numbering in the thousands or millions. And our eyes skim the results from the top, zeroing in on page titles and skimming descriptions of those titles that interest us. It's human nature to assess an environment quickly and take in key information at a glance. This is true even whether the environment is wilderness or Web page. It's important to keep this in mind when trying to attract hits. If a potential reader is going to click, the title and description must be compelling. They must signal to readers that the page has what they are looking for. What you're after is a strong click-through rate. A can’t-pass-up web feature is sometimes referred to as clickbait. We click almost unwillingly, sometimes putting everything else on hold. The very best strategy is to combine baited headlines with high quality online content as we build our brands. 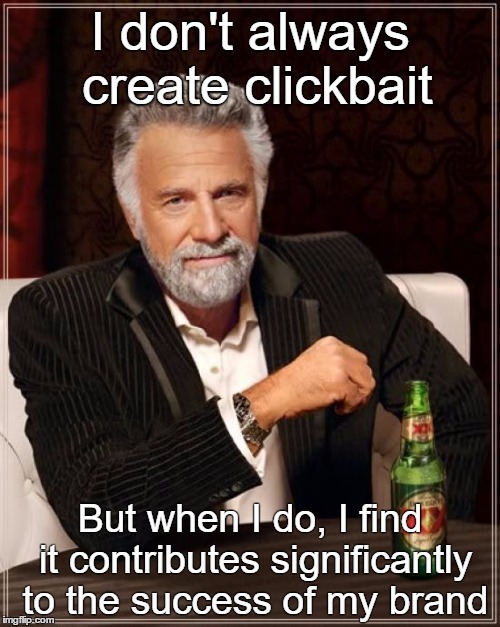 Clickbait headlines are, to an extent, a big part of reputation campaigns. Keep them brief. A skimming reader can’t take in a wordy headline, so you need to get your idea across in less than ten words—and eight is the magic number, according to researchers. Use a number. Seven Clickbait Articles You Can’t Ignore. And by the way, researchers aren’t quite sure of the reason, but they know that odd-numbered lists have a 20% higher click-through rate than even-numbered ones. Ask a question. When suddenly faced with a question, we can’t help but provide an answer. What’s your favorite color? What’s your lucky number? What’s your go-to pasta selection? Your brain came up with orange, thirteen, and rotini, even if you weren’t trying to play along. And look: suddenly we have interactive content on a very basic level. Go negative. We all appreciate people who look on the bright side—but negative headlines bring more readers—up to 30% more than neutral headlines and 59% more than positive ones. How’s this for a headline? “The Worst Thing You Can Do? Be Positive.” Why? Perhaps it's because of the negativity bias humans have. Use key phrases to lure readers. Check out Google Trends to see what the current popular searches are, and try to use relevant key phrases in your headlines to be part of the trend. Clickbait works. Familiar varieties include top ten lists, fact pieces, interviews, and many other familiar tropes. Why We Love ___________ – This is an example of a tried and true clickbait headline. The "Why we love..." headline tantalizes the reader but doesn't satisfy their desire to know - at least until they click... and that's the point. __ Secret Tips – Numbers are a good way to get people to click. The idea of a quick and easy list of tips draws people in very effectively. How To Solve ___________ – First, it poses something as a problem. Then it *almost* proposes a solution. But in order to get the solution you have to click - insidious. A List Of Best _________ – This is the "curation" model of clickbait. It makes it seem like someone has gone to the trouble of researching a long list of possibilities and providing the reader with a short list of the best. In reality these lists are usually sponsored by someone - usually the someone in the #1 position on the list. The Best/Worst... – Dramatic! Black and white! It doesn't answer the question, it just provides a dramatic counterpoint. Enticing! The Ultimate Guide to _______ – Who doesn't want the "ultimate" guide? The internet is stuffed with information, we all want the best or ultimate. So the ultimate guide to something must be the best... right? A solid headline and snippet (or search engine description) is only half of the battle - but it's the first half. Articles need enticing images to hold a reader’s attention. But bear in mind, not just any clipart will suffice. Art should be used with purpose. Is the image relevant? Is it of good quality? Does it have emotional appeal? What message does it send? The best images are unique to your page, perhaps custom provided—but at the very least not stock art that can be found on numerous similar sites. Studies of photos on Instagram reveal that photos featuring faces get 38% more likes and 32% more comments than photos of objects. When you have the option, have strong and relevant images accompany your articles. A baited or catchy headline can catch a reader, but compelling images help to hold them once they’re in. Learn more about how to create compelling web content here.